Scott, Robia. 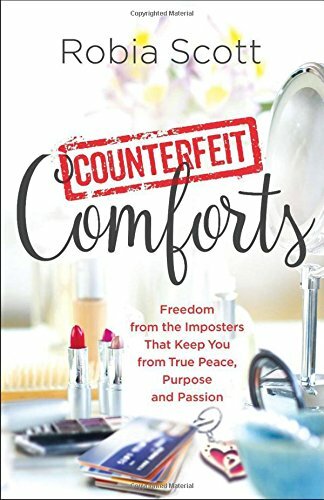 Counterfeit Comforts: Freedom from the Imposters That Keep You from True Peace, Purpose and Passion. Bloomington, MN: Chosen Books. 2016. Speaker, teacher and author, Robia Scott, explains the temporary comforts found in overcoming hardships. Teaching instead the freedom found through turning to the Holy Spirit, she shares the destructive behavior that can result from following the counterfeit comforts. With encouragement, compassion, sensitivity and understanding, Counterfeit Comforts offers personal stories, relevant scriptures, strong reminders, gentle patience and heartfelt support in transferring dependence from shallow comforts to the healing and freedom found from leaning on God. Though perhaps not exactly what I was expecting when I opened the cover of this book, I soon found myself nodding my head at some of the ideas found within. (Seriously, ice cream does help a tiny bit on those really hard days, right?) Through her own personal journey to healing and freedom with the Holy Spirit, Robia Scott is willing to be honest, straight-forward, and passionate for a successful change. With a section on changing your words, thoughts and actions from negative to positive, she leaves nary an excuse not to turn to God in difficulties (rather than ice cream). Possibly life changing for some. This entry was posted in Christian Books and tagged Christian, Christian Author, Christian Book Review, Christian Contemporary, Christian Non-fiction, Deeper Life, Devotional, Healthy Lifestyle, Holy Spirit, Inspirational, Robia Ministires, Robia Scott by Savurbks. Bookmark the permalink.